Technics SL-1000R review | What Hi-Fi? Few hi-fi brands enjoy the same kind of high street recognition as Technics does, and that’s pretty much down to the legendary status of its SL-1210 turntables in DJ circles. So when the brand was re-launched by parent company Panasonic back in 2014, it was something of a surprise that record players weren’t part of the equation. But demand from distributors and customers forced the company’s hand, and the excuse of a 50th anniversary saw the release of a special deck to celebrate. The reaction to that premium £3k deck was so positive that the company’s turntable range has since expanded to three domestic models, ranging from just over a grand to the high-end beast we have on test here. Now with the record player ball well and truly rolling, a more affordable, phono stage-equipped deck is imminent, as is a DJ offering. The SL-1000R sits at the top in Technics’s hierarchy, and to say it’s a beast is no understatement. This record player weighs in at over 40kg, so it’s a two-person lift, and at over 50cm wide, surely a stretch for most dedicated turntable supports. The heart of this turntable is its direct drive motor. That’s the main point of differentiation from most other high-end alternatives on the market, which invariably tend to be belt driven. On paper, direct drive promises impressive speed accuracy and stability, something that a stretchy rubber belt transmitting the torque from a motor to the platter just can’t compete with. However the downside has always been motor vibration, noise and precision of the spindle’s bearings – these things really matter when that motor is directly connected to the platter that the record sits on. The engineers at Technics have tackled these issues head-on and come up with a sophisticated double coil, twin rotor-type design. Not only is it capable of a high torque output – essential to move the hefty 7.9kg platter – but Technics also claims an astonishingly low wow & flutter figure of 0.015%. This is said to be at the limit of what can be measured and is at least a factor of ten better than most belt drive designs. Great care has been taken to reduce vibration inside the motor structure and improve the design’s rigidity, as well as making it spin as smoothly as possible. The next piece of the direct drive jigsaw is speed control of the motor. Here the engineers have opted for an external power supply, which uses a switching circuit with noise filtering and a precision digital servo system that uses optical sensor to detect speed variations. The outboard supply offers 33.3, 45 and 78rpm speeds and allows subtle adjustments down to 0.01 of a revolution per minute. The final piece of the speed stability equation is the heavyweight platter. This has a triple-layered construction of brass, die-cast aluminium and rubber (for damping purposes). The company then adds 12 tungsten weights around the perimeter to increase rotational mass, which helps with speed stability. During the manufacturing process, each platter is balanced on the same type of machine as used to balance the wheels of Japan’s famous Bullet trains. Being balanced just helps smoothness of rotation. Of course none of this would matter if the plinth design weren’t as thoroughly engineered. It has a three-layer construction of a 25mm thick aluminium top panel, BMC (bulk moulding compound) and a further die-cast aluminium section. The idea is to have a rigid, low resonance base for the mechanicals to work on. The feet that provide the isolation from the equipment support are equally considered in their construction, consisting of silicon rubber and microcell polymer elements housed by a die cast zinc casing. They’re adjustable to allow levelling on an uneven support. The record player’s overall build and finish is just as good as the price point demands, and the SL-1000R gives off such an impression of quality and obsessive attention to detail that we wouldn’t bet against a life span of many decades. Technics has stayed true to its heritage in the arm design. The one used here retains the classic S-shape arm tube from older models, but is made of magnesium for low weight and damping characteristics, while its ruby bearings are hand adjusted to ensure the minimum of free-play. This arm has an effective length of 10 inches compared to the more conventional nine-inch designs found on most rivals – this is to reduce tracking distortion as the cartridge moves across the record surface. Where you’d expect to find a headshell, you just get a locking collar. Technics leaves the choice of headshell to the customer. It’s a standard fitting on the tonearm and there are plenty of options available from cheap (below £30) to exotic (£100s). Considering the price of the SL-1000R, it seems a little mean of the company not to provide one as standard. Of course, there’s no cartridge supplied either, but this is normal with a product of this kind. Our review sample comes with a DS-Audio HS-001 Duralumin (a light, rigid alloy) headshell (£395/$420) and a Kiseki Purple Heart moving coil cartridge (£2495/$3199). While it’s possible and tempting to get cheaper alternatives, a deck at this level deserves quality partners or you won’t hear what it can do. The same goes for partnering equipment. We use our normal reference system of Cyrus Phono Signature/PSX-R2 phono stage/power supply, Gamut D3i/D200i pre/power and ATC SCM50 speakers to good effect. Our long-time reference turntable is Clearaudio’s belt-driven Innovation Wood, fitted with the partnering Universal tone arm and Stradivari V2 moving coil cartridge. 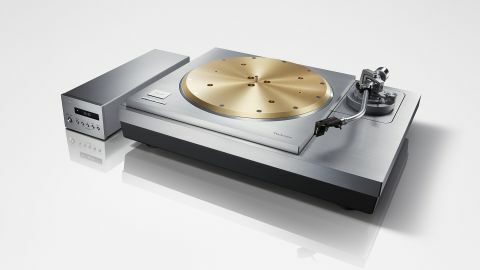 It adds up to just over £15k, so that makes it a direct rival to the Technics. The comparison is fascinating. But first, we spend time listening to the SL-1000R on its own terms, and we’re deeply impressed. It doesn’t matter what kind of music you play – from a large-scale classical work such as Orff’s Carmina Burana to Nirvana’s highly-charged Nevermind – this deck takes it all in stride. It sounds impressively composed and displays an astonishing amount of control, no matter how complex the recording gets. The Orff piece is savage at times, with wild crescendos that can sound truly chaotic, but not here. Without diluting the highly charged nature of the music, the Technics organises things with class-leading composure. Each note is rendered with precision and the kind of explicitly drawn leading edges that are so rare to hear with record players, regardless of price. The whole presentation is built on a wonderfully quiet noise floor, which speaks volumes for the quality of the massively built plinth and that highly developed motor design. A low noise floor helps with dynamic expression and the resolution of fine detail. The SL-1000R excels in both areas, delivering both large and small-scale shifts in intensity with ease. It digs up a massive amount of detail too, rendering the harmonic texture of instruments with clarity and confidence. The sheer scale and authority of the Technics’ presentation is admirable, but our attention is drawn to the player’s stereo imaging. We can’t recall hearing another similarly priced deck that delivers stereo soundstaging with such precision and focus. It’s a wide soundstage populated with precisely focused instruments and it stays stable even when the music gets busy. Playing Nirvana shows that the SL-1000R is happy to party. It delivers Nevermind with the full-throttle enthusiasm it deserves. There’s plenty of attack and excitement, but if you want to sit back and analyse the record, the Technics is more than happy to oblige. You won’t be able to do it for long as little we’ve heard comes close to matching the way this turntable delivers bass. It’s taut, textured and tuneful, lacking nothing in weight or agility. Add excellent rhythmic drive into the equation, no doubt aided by the deck’s terrific speed stability, and you have a superb all-rounder that’s happy to play whatever kind of music you feel like. Throughout our time with the player we listen to everything from Bob Marley, Radiohead and Beethoven and the SL-1000R never breaks stride. It really is a formidable all-rounder. Comparisons with our reference Clearaudio are illuminating. There’s no doubt that the Clearaudio has an even more fluid way with dynamics, drawing Miles Davis’s Kind Of Blue in a more atmospheric, full-bodied way. It’s close, but we think it even resolves a touch more detail – though you’ll need a truly transparent and highly resolving system to hear it. The Technics counters with a better sense of sonic stability and focus. It’s a punchier performer and draws the outline of notes with greater precision. The SL-1000R also has grippier, better-defined bass and almost makes the Clearaudio sound a little soft and vague in this region. The bottom line is that they’re both truly excellent record players, and if you’re in the market for a deck at this level you should audition both. We had doubts when we first heard about the SL-1000R. It seemed so expensive, so outside the company’s natural stomping grounds that we feared the worst. Technics’s reputation in turntables is built on its DJ credentials, but those decks were relatively affordable, brilliantly engineered and massively durable. They had to be to thrive in such a tough environment, yet, as standard (unmodified that is), the samples we’ve heard over the years have been far from sonic benchmarks in the domestic arena. That’s not the case here. Despite that sky-high price tag, the SL-1000R should be considered one of the class leaders. It is able to stand toe-to-toe with any rival without worry, and that’s something worth celebrating.